Global Competitiveness Empowerment Forum (GCEF) organized the Fair Player Club Seminar for Compliance and Business Ethics with China which was held on Wednesday, December 20, 2017 at Chamber Hall (B2F), Korea Chamber of Commerce and Industry, Seoul, Republic of Korea. 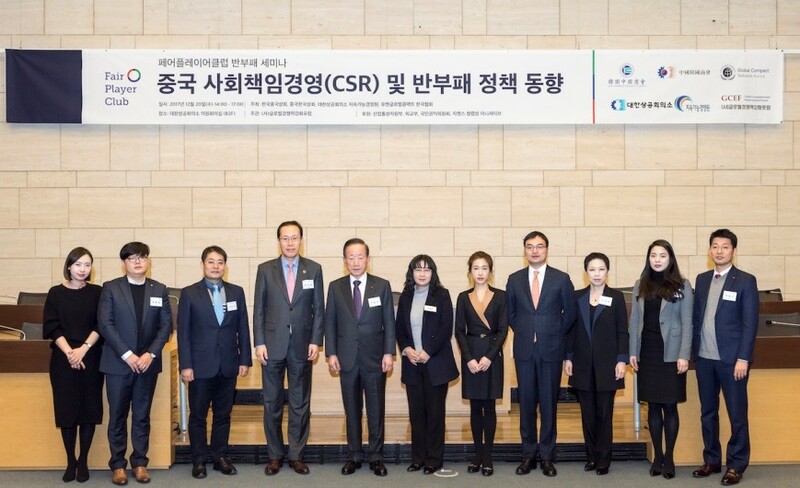 The Seminar introduced China’s Corporate Social Responsibility and anti-corruption policy trends with an aim to promote collective action for anti-corruption among companies in Korea. The Seminar introduced China’s Corporate Social Responsibility and anti-corruption policy trends with an aim to promote collective action for anti-corruption among companies in Korea. Mr. Hui Xu, Partner of Latham & Watkins presented characteristics and implications of Chinese Anti-Corruption Law and Policy, focusing on Chinese Criminal Laws and 2018 amendments to Anti-Unfair Competition Law (AUCL). He commented that “the seminar is timely and meaningful, with the AUCL’s amendments being made first time in 24 years, and soon to be effective as of January 1st, 2018.” Mr. Xu explained several highlights of AUCL amendments, which include: “bribery through a third party will be criminally liable, and if an executive takes lead in accepting bribery, both the individual and the business operator will be held liable,” “regarding administrative penalty on commercial bribery, if company has conducted legitimate and reasonable compliance measures, policies and controls in operation, penalties may be mitigated or exempted.” He also shared information on facilitation payment, different ranges in counterparties, and recent bribery cases. 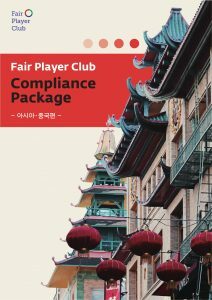 The seminar also included introduction of ‘Fair Play Compliance Package – Asia: China edition’, newly researched and published by Fair Player Club. Compliance package is a guideline to help Korean multinational corporations to establish compliance program based on different laws and policies in the overseas markets. The Asia: China edition introduces anti-corruption environments and policy trends in Asia as well as China’s anti-corruption laws and policies, characteristics, and case studies of business violations and responses. Ms. Lee Eun-kyung, Chief/Senior Researcher of the GCNK introduced the ‘Fair Play Compliance Package – Asia: China edition’ while explaining global anti-corruption trends: The U.S. Department of Justice making the FCPA’s Pilot Program permanent, G20 Anti-Corruption Action Plan 2017-2018, key outcomes of Asia-Pacific – Global Corruption Barometer (Transparency International, 2017), and China’s AUCL amendments. She emphasized that “Malaysia and Vietnam are dealing with the most severe corruption problems in Asia”, while “Chinese government continues to strengthening its anti-corruption campaign and enhancing international cooperation, as noticed from China joining the United Nations Convention against Transnational Organized Crime and United Nations Convention against Corruption from the early stage." Moreover, she explained China’s newly amended AUCL’s retainment of safe harbor provisions for business operators, clarification of corporate liability on commercial bribery, and increases in administrative penalties for commercial bribery, while presenting business case studies, including GlaxoSmithKline (GSK). For presentation of best business practices in CSR, LG and Siemens Ltd. Seoul shared their compliance programs and know-hows. Mr. Kim Jong-pil, Senior Manager from LG, introduced their compliance risk management system, and presented their CSR practices in China along with their programs for Jeong-do management (doing business in a transparent and honest manner) such as signing anti-corruption agreements and operating hotlines. He also illustrated LG’s corporate culture, in which all employees, before beginning of every major meeting, remind themselves of founder’s inspirational quote: “Business must consider the welfare of society it is in, and support the nation’s long-term well-being.” Moreover, he emphasized LG’s efforts to embed principles of Jeong-do management. Ms. Lee Eun-joo, Compliance Officer of Siemens Ltd. Seoul, explained the process of building compliance system and strong leadership that made Siemens a corporation with world-class business ethics system today. She mentioned that “in the past, lack of compliance in business meant sanctions. On the other hand, compliance has become an indisputable factor in business culture today. In Siemens, there used to be prior approval system, but now it is disappearing.” Additionally, she introduced ‘Tell us’ program and highlighted the importance of guaranteeing anonymity in whistleblowing system. Lastly, Ms. Angela Joo-hyun Kang, Founder/Executive President of the Global Competitiveness Empowerment Forum asked for continuous interest and participation of all attendees as she introduced Fair Player Club and Fair Play Pledge. In 2017, the last year of Fair Player Club project, we have successfully co-hosted seminars in cooperation with foreign embassies and chambers of commerce including Sweden, United Kingdom, United States of America, Germany, EU and China. On January 26th 2018, we are planning an ASEAN seminar. Please contact FPC bureau for any query regarding seminar or joining the Fair Player Club.